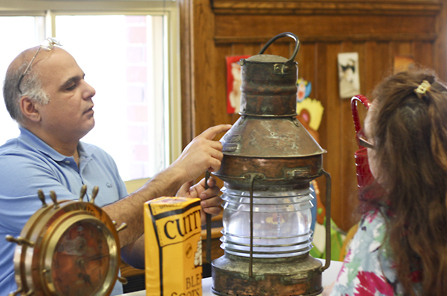 After sailing the high seas and landing in the home of a Baltimore ship surveyor, some nautical treasures washed into the hands of antiques appraiser Alex Moshtagh at Community Centre 55 last week. Shelly Hill shows a collection of nautical antiques inherited from her uncle to appraiser Alex Moshtagh. Beach resident Shelly Hill says the nautical pieces she brought in – a captain’s clock, a copper ship’s lantern and a stash of aged Scotch whiskey – are just a few of the gifts her uncle John Wallace received from ships’ captains in his 27 years as a ship surveyor for Lloyd’s Register. Wallace, who passed away just last month, travelled up to 6,400 km a month to inspect and certify ships that had run into trouble in US, Caribbean or Central America. The two-foot tall copper and glass ship’s lantern that Hill brought in for appraiser Moshtagh is the smallest of seven her uncle collected, she said. Moshtagh, who curated a private collection for 10 years before joining Oakville’s Treasure Antiques, said the lantern is worth about $1,000 and would likely fetch twice that in Baltimore, where it has a connection to a local shipyard. Prices for such pieces have taken a hit in the current economy, he said. Nevertheless, he said Hill’s lantern is fairly rare and has a particularly attractive look. Moshtagh says the Beach has yielded some highly valuable antiques before. At another drop-in appraisal last year, one Beacher brought in a painting that Moshtagh recognized as a Franz Johnston, a Group of Seven painter. It is likely worth some $25,000, he said.